Wayne Wang (traditional Chinese: 王穎; simplified Chinese: 王颖; pinyin: Wáng Yǐng; Jyutping: Wong4 Wing6; born January 12, 1949) is a Hong Kong–born American film director. Wang was born and raised in Hong Kong, and named after his father's favorite movie star, John Wayne. When he was 17, his parents arranged for him to move to the United States to study, to prepare for medical school. Wang, however, soon put this plan aside when his 'eyes were completely opened' by new experience, and as he turned to the arts, studying film and television at California College of Arts and Crafts in Oakland. 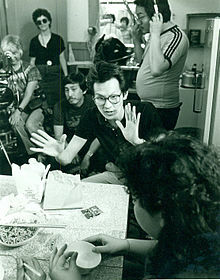 Chan Is Missing (1982), Dim Sum: A Little Bit of Heart (1985), and Eat a Bowl of Tea (1989) established his reputation. He is best known for The Joy Luck Club (1993), Maid in Manhattan (2002), and the independent features Smoke (1995) and Anywhere but Here (1999). 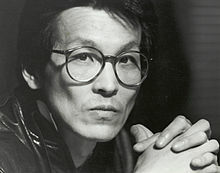 At the 2007 Toronto International Film Festival, Wang premiered two feature films, A Thousand Years of Good Prayers and The Princess of Nebraska, as well as appearing in the Arthur Dong documentary film Hollywood Chinese. He won the Golden Shell at the San Sebastian Film Festival in September 2007 for A Thousand Years of Good Prayers. In 2016, he won a Lifetime Achievement Award at the San Diego Asian Film Festival. He is married to a former Miss Hong Kong, Cora Miao, and lives in San Francisco and New York City. ^ a b Lim, Dennis. "Wayne Wang, Bridging Generations and Hemispheres." New York Times. 12 September 2008. ^ Mitchell, Elvis; Ed. Lia Chang (2000). "Fade to Black With Auteur Wayne Wang". AsianWeek (10 Aug – 16 Aug). ISSN 0195-2056. Archived from the original on 2008-10-15. Retrieved 2008-07-19. Born and raised in Hong Kong, Wayne Wang came to the United States at the age of 17 to study painting, filmmaking and TV production at California College of Arts and Crafts in Oakland, Calif.
^ G. Allen Johnson (October 18, 2008). "Wayne Wang's 'Princess' paves way on Internet". San Francisco Chronicle. Retrieved 2008-10-18. His "The Princess of Nebraska," a San Francisco-shot tale of a young Chinese immigrant dealing with an unwanted pregnancy, is thought to be the first feature film by a major director to premiere – without a domestic theatrical or DVD release – on the Internet. ^ Tong, Allan (2007). "Wayne Wang Interview". Exclaim! Magazine. Retrieved 2007-10-23. ^ G. Allen Johnson (October 1, 2014). "'Soul of a Banquet': Wayne Wang's documentary on Cecilia Chiang". San Francisco Chronicle. Retrieved May 20, 2017. Wikimedia Commons has media related to Wayne Wang.